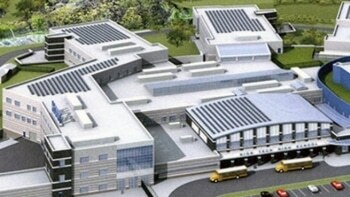 Construction has begun in Secaucus, N.J., on a new campus for the Hudson County Schools of Technology's High Tech High School. The Jersey Journal reports that the school will leave its existing campus in North Bergen when the $160 million, 350,000-square-foot facility is completed in 2018. High Tech High is one of the Hudson County Schools of Technology and draws students from all over the county. The new 22-acre facility will have capacity for 1,500 students—about 250 more than the existing campus. The building will have self-contained wings for academic concentrations, such as performing arts, culinary arts and mechatronics. Hudson County Executive Tom DeGise said replacing the 100-year-old building has been a top priority. Officials say proceeds from the sale of the& existing building will be put toward the project. The state approved funding for 59 percent of the project, and the county will cover the rest. The architect is DMR Architects, and the builder is Terminal Construction Corp.